FAYETTEVILLE, Ark. 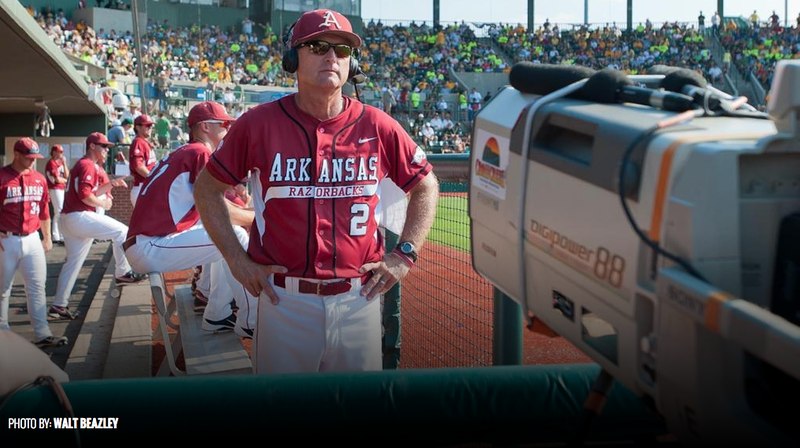 – To go along with an unprecedented 11 national television games, the Arkansas baseball team will also appear on Cox Sports Television four times during the 2015 season. Cox Sports will televise all three games the second weekend of the year when Arkansas travels to Mobile, Alabama to take on UCF (Feb. 20), South Alabama (Feb. 21) and Maryland (Feb. 22) at Stanky Field. The Razorbacks will play one final game on CST on March 25, traveling to Memphis for a 5:30 p.m. first pitch at FedEx Park. All four games will also be available on the WatchESPN App. Cox Sports Television reaches nine states, including Louisiana, Texas, Oklahoma, Arkansas, Mississippi, Florida, Georgia, Virginia and Missouri. The network is an innovative 24-hour local sports network that delivers exclusive programming and since launch in 2002, has grown to nearly 5.5 million viewers. Arkansas now has 15 televised games, with every home game and all road SEC games appearing on TV or the WatchESPN App. The Razorbacks still have season tickets and Friday/Saturday SEC mini plans available as the 2015 season-opener is set for Friday, Feb. 13 against North Dakota at Baum Stadium. Arkansas returns six position starters and seven pitchers from a squad that posted 40 wins and made the program’s 13th consecutive trip to the NCAA Tournament during the 2014 season. The Razorbacks are one of just seven teams in the country to advance to each of the last 13 NCAA Tournaments as they look to make it 14 straight during the 2015 season. Arkansas has appeared in seven College World Series, five Super Regionals and 27 NCAA Tournaments in program history.